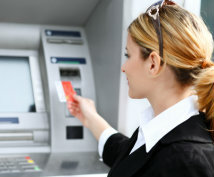 Just like you're not confined to one area, your access to surcharge-free ATMs isn't either. Travel freely across the United States without worrying about taking pesky ATM fees along for the ride. F & M Community Bank is a proud member of the Shazam ATM Network, offering you access to thousands of surcharge-free ATMs, nationwide. Finding a nearby ATM is easy: simply go online and use the Shazam ATM locator or download the free app to your iPhone or Android phone. Avoiding fees is that simple. Enjoy worry-free travels — look for the Shazam logo wherever you go.